Hello-Hello, what a delightful Tuesday it has turned out to be, we hope yours is the same, filled with sunshine and lots of laughter. It seems like a good time for an update on True Prep, there have been oodles of articles on the book, as well as loads of parties and book signing events, like this one at the Sperry Top-sider store in Kansas City. And this one at the Lilly Mother Ship store in King of Prussia. 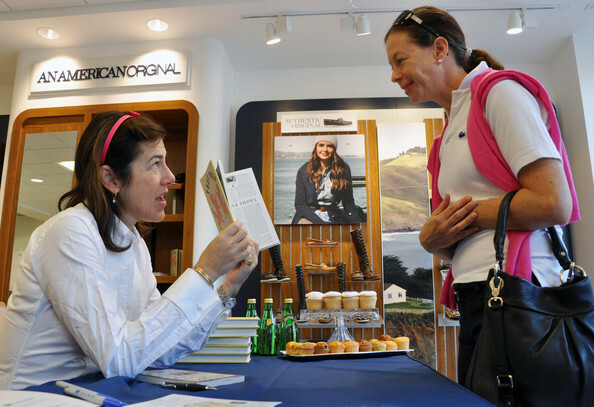 She has also been taken aback by the intense affection people still have for The Official Preppy Handbook, saying she didn’t realize how much it meant to people, let alone the impact some readers say it had on their lives. Reading about the antics of preps getting together in other parts of the country is always fun, below we see two of our faves, Hopsy (aka Monograms & Manicures/Kappa Prep) as well as Miss Tickled Pink & Green at the Dallas event in October. Discussion about the “commercialization of prep” as it relates to the book prompted us to ask Ms. Birnbach about products and brands heavily showcased in the new book and/or at events on the book tour. Back to that nasty and oh-so-not-done conversation about True Prep and merchandising, there are products being marketed for which Ms. Birnbach does receive some compensation. The licensing agreement with Vineyard Vines is a good example of such an arrangement. The collection includes a True Prep Polo, a tie and Beach Bag. We then moved on to the next topic, asking Ms. Birnbach about reader reactions to the book. As an FYI, the harshest criticism the author can level at someone or something is that it “isn’t nice.” And when discussing the “too inclusive” crowd, she is understandably emphatic. It is at this point where both Ms. Birnbach and TP commiserate about “how things used to be”. 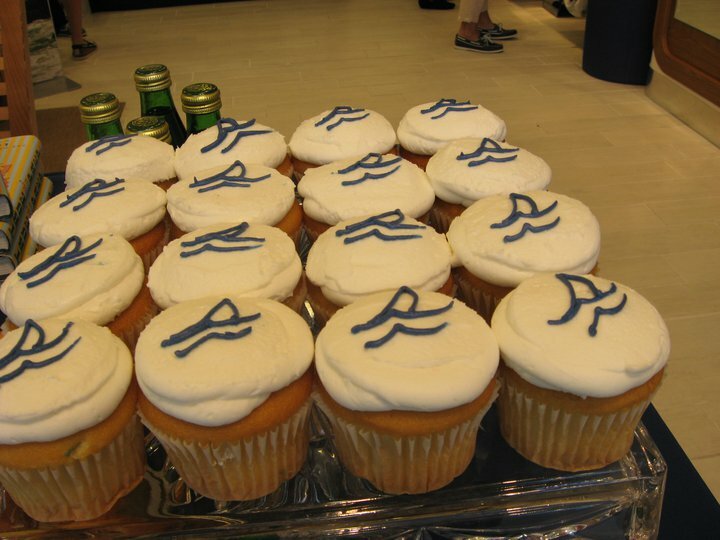 And since we are talking about cupcakes we simply had to share these darling pink whales from the big party celebrating Vineyard Vines’ grand opening of its new store in Palm Beach Gardens. We’ll have a look at some of the reviews for True Prep later this week. A quick note geared more toward the MOTH (Man of the House) in your life, the first involving a Princess fave, Bill’s Khakis. In honor of its twentieth year in business, Bill’s is launching a special pair of khakis, the Camerton Twills. 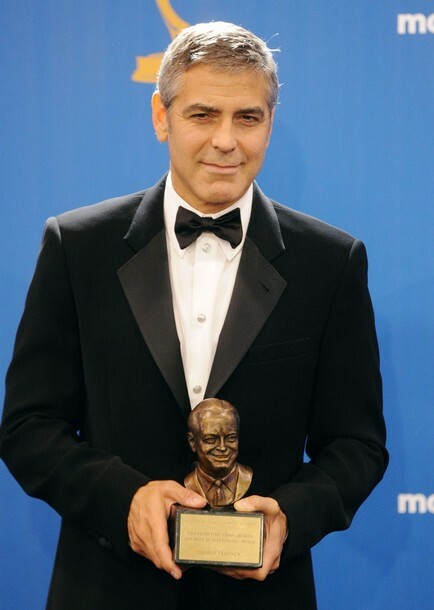 A portion of proceeds will benefit the USO, another reason we adore Bill’s. Our thanks to The Trad for the tip. On that note we say g’bye until next time! Hello-Hello, is everyone ready for a weekend? We thought it was time for another True Prep update, the volume of media surrounding the book is significant, including multiple declarations that ‘prep is dead’; in at least one instance responsibility for this hypothetical occurrence is linked directly to the book. The writer doesn’t fault the skill set of authors Lisa Birnbach and Chip Kidd, looking instead at the consumption habits of the era, particularly those of the conspicuous kind. “Cracked heirlooms, threadbare antique rugs, sturdy L.L. Bean boots, duct-taped Blucher moccasins, and workhorse Volvo station wagons defined OPH’s aesthetic. True Prep’s preppies, armed with BlackBerrys and iPods, wear Verdura jewelry and Prada and vintage Gucci loafers, tote Goyard and Tory Burch bags, and adorn their desks with tchotchkes from Smythson (a firm whose success, Ian Jack notes in The Guardian, has been built “on selling baubles to the impressionable rich”). It’s no secret we whined struggled with some of the brands featured in True Prep. (For Ms. Birnbach’s comments regarding the J. Crew metallic Top-siders at J. Crew, simply click here.) We have been vocal about the volume of J. Crew & Burberry products showcased in the book. Frequent readers know the tragic truth: TP and The Consort are two boring, old-school preps. Our style is basically no style. Eric Felten cites TOPH (The Official Preppy Handbook) as a factor. 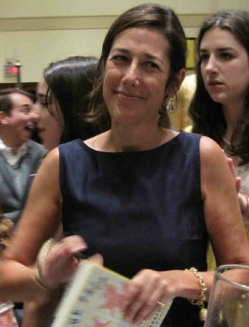 The notion that Ms. Birnbach is responsible for the work ethic of a generation is ludicrous. Blaming These Challenging Times on any single author just doesn’t work for us. Oops. Hopefully Melanie, I Pick Pretty and other notable Austin denizens won’t tell Ms. Thompson next time we visit. The Argyle Pullover is available at Elegant Baby, and there is also a version in blues if looking for something a little more sedate. With that, we are off to enjoy the weekend, and hope you are able to do the same! Hello-Hello, here at the Prepatorium it is a stellar Thursday, in part because we are *finally* getting around to our much-delayed giveaway! 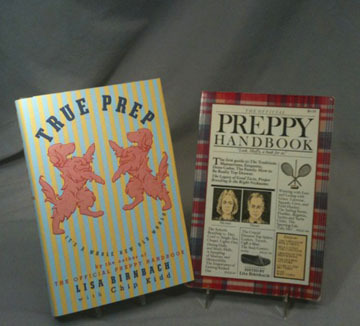 The good folks at Random House sent us an amazing gift bag filled with all manner of treasures, we’ll get to those momentarily, however, the first gift bag business involves reading material: the giveaway includes both “True Prep” from Lisa Birnbach and Chip Kidd, as well as an authentic copy of The Official Preppy Handbook. "Two! Two! Two Preps in One!" Yes, TP is surrendering one of her copies; we must all make sacrifices, and today we offer this up for The Planet’s greater good. (Heh, heh, heh.) With 1.3 million copies of TOPH sold, and True Prep’s continued presence on the NY Times Bestseller list, clearly this is paradise for one lucky prep. We admit to being excited about our Giveaway; it’s crisp and cool outside, a good time for a little fun and frivolity, oui? Here is the scoop on how to enter. For multiple additional entries, tell a friend! For each friend leaving a comment that mentions your name (or your blog or email or other means of identifying you) you receive two additional entries! Entries will be accepted until midnight on Wednesday, October 13th and we shall announce the lucky winner in Thursday’s post. Enter early, enter often, and please come back to visit with us again! Hello-hello, we are clearly embarking upon another wild and wacky week here at the Prepatorium, how are things shaping up in your corner of the globe? We begin with a look at one of the first big reviews for True Prep, this one from Janet Maslin in the Times. Ms. Maslin begins with a look back at the volume preceding True Prep, TOPH, along with another classic. Above, that iconic cover of Take Ivy. The review mentions some of the societal changes since TOPH was first published. Below, one of many illustrations in the book. Overall Ms. Maslin’s review is positive, with appreciation for the book’s humorous style and efforts to update common topics. Click here to read the review in its entirety. Also of note, this month’s Allure features a True Prep tie-in piece, our thanks to the Bellini Bunny for showcasing it on her blog. The story contrasts popular styles of today with styles back in 1980 when TOPH was published. Also meriting a visit, Apartment Therapy’s “Waspy Whimsey“. Guerrin Gardner and Mat Sanders put together ﻿﻿a wonderful styleboard inspired by the book. For anyone interested in the schedule with dates and times for True Prep Book Tour events, click here; the link takes you to a page with all that info and more, The Consort the IT department put it together for the site. We quickly revisit some of last night’s fashionable (or not) moments at the Emmys. Below, three stars of Mad Men, January Jones in Atelier Versace, Elizabeth Moss in Donna Karan, and Christina Hendricks in Zac Posen. Below, Sally Draper actress Kiernan Shipka at the event. 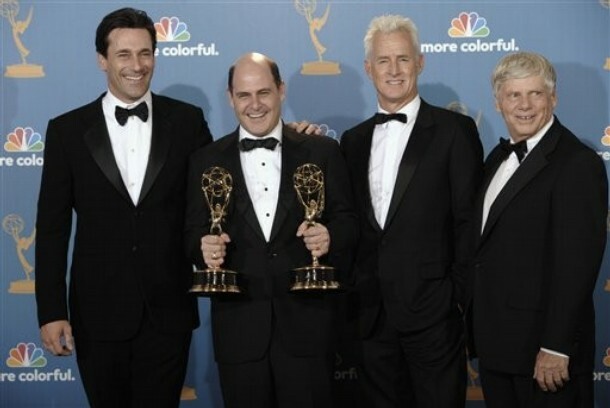 Here are a few of the Mad Men, along with the show’s producer, Matt Weiner. 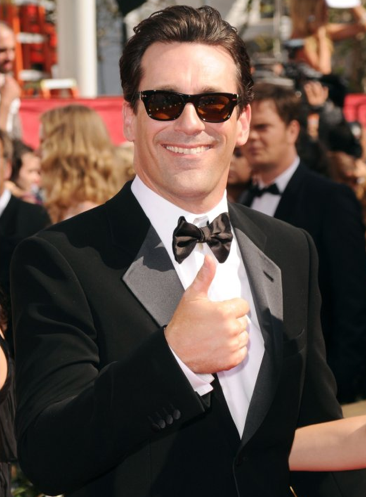 Actor Jon Hamm and longtime partner Jennifer Westveldt both wore Armani for the big do, while Tina Fey opted for a stunning Oscar de la Renta gown. Perhaps the most unusual dress was worn by Rita Wilson, seen here with husband Tom Hanks. The dress and shoes were both from the Prada runway show, we don’t know who did the handbag. We generally adore Ms. Wilson’s style selections, but this one just didn’t work; it was a classic case of the dress wearing her, not the other way around. Actress Claire Danes was a knockout in Armani. We leave you with two more images from last night’s festivities. We must begin with an enormous “Thank You” to everyone who left such kind and lovely comments following Friday’s post, not to mention the Tweets and Facebook comments. There is no adequate way to explain how touched we were by the sentiments, it made our day extra special. 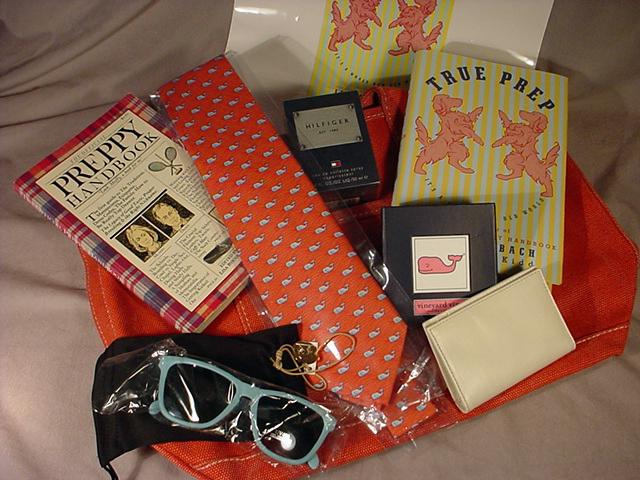 Today we have breaking news just in to the Prepatorium: there is another preppy resurgence! Oh my! They promote the Summer at the Cape collections. To read the story in its entirety, click here. One of our favorite blogs, All the Rage, also previews the upcoming book in this piece by Adam Tschorn. This photo collage is used to illustrate his story. Below, two shirts from Robert Graham. Ms. Birnbach also chats at length about Tory Burch in the story. We recommend popping over for a read, it is a fun piece. Saying we were astonished would be an understatement, and we send our thanks to Ms. Blake for including us with such illustrious company. To see the rest of her post just click here. 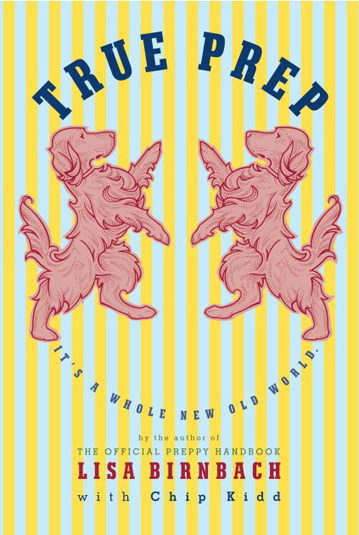 We conclude all this blather with a cautionary note: it is likely we shall encounter an increasing volume in the mainstream media about the preppy aesthetic being raised from the dead (ahem), in sync with the calendar’s movement toward True Prep’s September release date. And with visions of books dancing in our head we say, g’bye! Hello-Hello, and Happy Thursday! With any luck at all you are enjoying a warm and sunny day filled with promise and thoughts of good things to come. 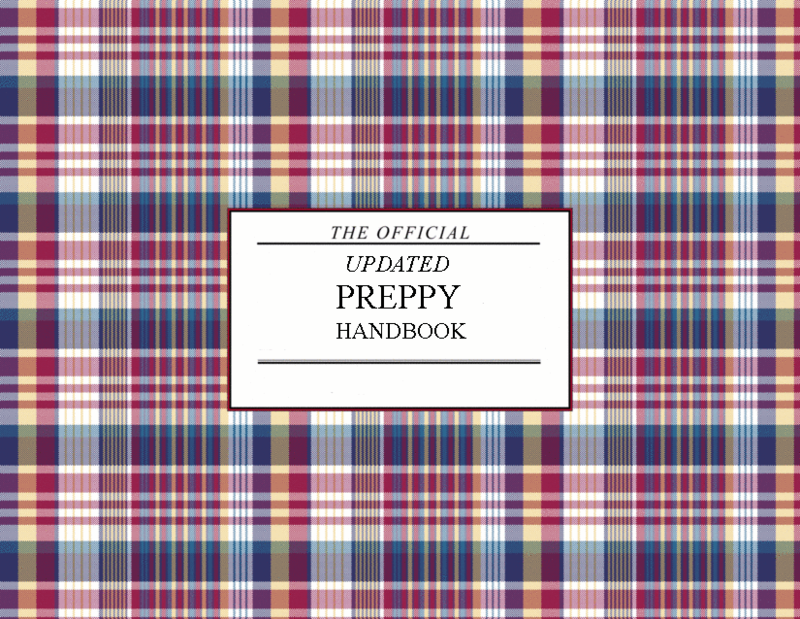 Official Preppy Handbook fans and followers are sure to be elated by news that author Lisa Birnbach is coming out with a new version of that classic volume. Clearly the update has merit, offering serious possibilities. How shall the notion of ladies playing on the men’s course be handled? What about the errant child wanting a tattoo? (The horror!) We expect Ms. Birnbach and co-author Chip Kidd will provide us with an entertaining perspective on the perils a prep faces in the new millenium. We have long wondered if there would be an update to the original, as it seemed an idea begging to be done. And when we saw this blog site we had hope. Alas, the “Official Updated Preppy Handbook” blog hasn’t been updated since last December and the total number of posts comes in at a scant 12. We must be candid in our thoughts on the original: it is something we loved reading, we still have a copy here at the prepatorium. We adore the writing style, the goofy (but spot-on) illustrations, the fact the entire topic is approached from a tongue-in-cheek perspective. We consider it a classic. However (and this is where some may find us heretical), it is not our bible. We don’t have a lifestyle bible. We simply are what we are. We were fortunate to grow up in circumstances similar to those depicted in the book, but we never made, nor do we now make conscious decisions to ‘dress preppy’. When it comes to apparel we wear Brooks Brothers or LL Bean or Lilly because it is what’s in the closet, mixed in among the Target tees and polos found at an outlet mall. We merely seek that which is classic, stylish and of good quality and we guess most readers are of a similar mind. • Wardrobe: Recent prep brands we are forced to recognize. How to tell Casual Friday from, say, Saturday. • Money: We never talk about it. • Food: Does the Food Network mean we’re going to have to cook? Bake? Now you’re going too far. • Scandals: Poor Mrs. Astor. When Mummy’s plastic surgery goes terribly wrong. Rehab and the slammer: the new prep schools. • We’re outta here: When to name something after yourself, and when not. The right obituary. What to do with your dogs if you predecease them. • NO TEXTING AT THE TABLE, PLEASE. You know TP is simply *dying* to hear about those ‘prep brands we are forced to recognize‘. 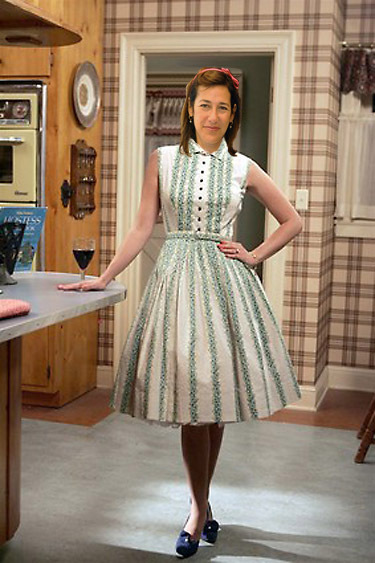 We can’t wait to see how those pesky and persistent logos are treated by Ms. Birnbach. The subject opens a whole new world of possibilities, don’t you think? Who do you think belongs on the list of brands to be recognized and who do you should be placed in the Fashion No-No column? Do tell, expiring minds are dying to know! Smiles to all of our cherished readers, we do appreciate you visiting!